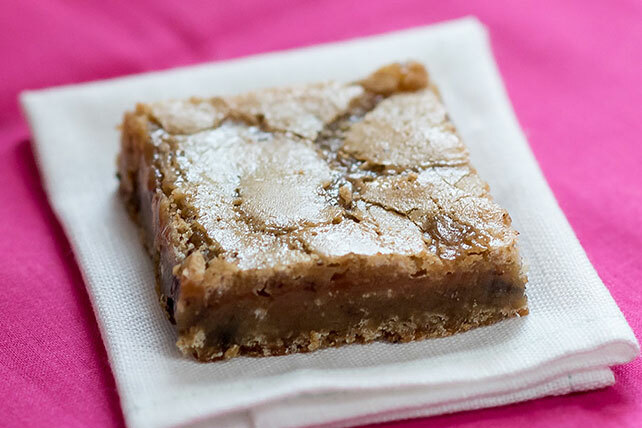 Have a blonde moment with these delicious Caramel Swirl Blondies. Melted caramels are swirled through blonde brownie batter for scrumptious bar cookies. Blondes do have more fun–if they've just made a batch of these! Line 13x9-inch pan with foil, with ends of foil extending over sides; spray with cooking spray. Combine sugar, butter, eggs, vanilla, nuts and chocolate in large bowl. Mix flour, baking powder and salt. Add to sugar mixture; mix well. Reserve 1 cup batter for later use; spread remaining batter onto bottom of prepared pan. Bake 15 min. or until firm. Microwave caramels and milk in microwaveable bowl on HIGH 2 to 2-1/2 min. or until caramels are completely melted, stirring after each minute. Pour over baked layer in pan; spread to within 1/2 inch of edges. Spoon reserved batter over caramel layer; swirl gently with knife. Bake 15 to 18 min. or until center is set. Cool completely. Use foil handles to remove dessert from pan before cutting into bars to serve. Store these tasty treats in an airtight container at room temperature for up to 5 days.